In one of the fastest sequel turnarounds you'll see in gaming, last month's fun and funny fantasy action game DeathSpank will be succeeded in September by DeathSpank: Thongs of Virtue. It turns out they were making two DeathSpanks all along. The new DeathSpank, Thongs of Virtue, is a promised 50% longer new adventure that brings the first game's ridiculous and overconfident swordsman into strange new settings, from the one teased at the end of the first game (and shown in the image atop this post), to the high seas, the North Pole and elsewhere. The downloadable game, which was being made at the same time as the first DeathSpank, will launch on the PlayStation 3's PlayStation Network on September 21 and follow on the Xbox 360's Xbox Live Arcade a day later. "There will be more adventure and puzzle questing in this game, but the hack and slash remains," producer Hamish Millar at development studio Hothead Games told Kotaku in an interview about the sequel. The gameplay mechanics and style won't be different. Thongs of Virtue, like its predecessor is a cartoonish comedic riff on the kill-fest and loot-collecting of Diablo. But the occasional adventure-game-style puzzle from the first game — combine this inventory item with that one to satisfy this farmer's request in order to open this gate, for example — will be more pronounced. Millar isn't just promising that the game will be longer. He promises it'll be funnier. Of all things, we might consult the Thongs of Virtue press release to test that boast. It describes the plot of the game: "A long time ago, nine mystical thongs were planned to bring balance and harmony to the universe, but when marketing got in the way, only six thongs were produced, and the result was disastrous. Granting great power to those who wear them, the thongs corrupted all those they touched—except DeathSpank. DeathSpank must find all six thongs and destroy them once and for all." That's not proof, but there is potential." The plot technically follows the events of the first game, but Hothead producers told Kotaku that gamers can comfortably play Thongs of Virtue without playing the original. They'll just miss some background references. 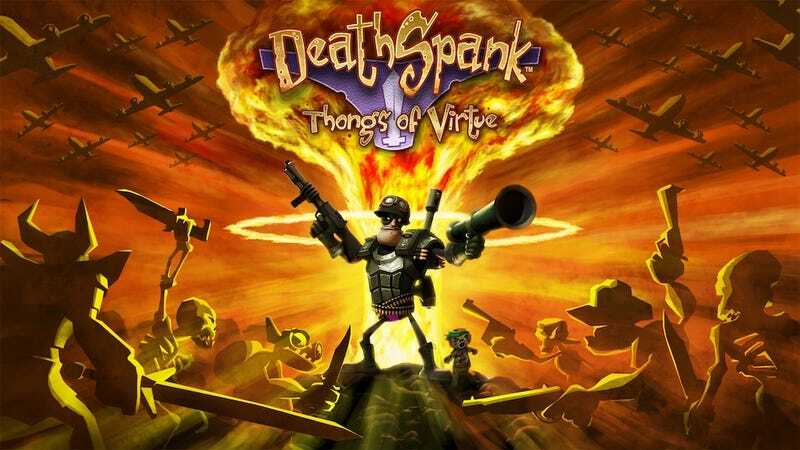 The first DeathSpank was promoted as the brainchild of Hothead and Secret of Monkey Island designer Ron Gilbert. Gilbert's involvement was supposed to be a guarantee that the game was funny. "Ron is as involved in this [new DeathSpank] as he was in the first one," Millar said. "The humor didn't just come from Ron. We have a huge amount of the personality of the team injected into the game. The two DeathSpanks were made in parallel at Hothead, with the added time for the second ensuring that the new game could be bigger. That creation schedule does't mean that the new game could incorporate much of the fan feedback toward the first one, though. Thongs of Virtue won't reflect any major changes demanded by the DeathSpank public. Online multiplayer, for example, still won't be in the game, though the off-line two-player co-op will now allow the second player to alternate between two characters, conrollingthe returning Sparkles the Wizard or using — quoting the press release again — "the ninjatastic Kung Fu moves of DeathSpank's new partner in crime, Steve." Players won't bring their progress from the first game. DeathSpank sequel players start leveling their hero up from scratch. Because it depicts into more modern settings, the new game will introduce a greater percentage of projectile weapons to its arsenal (translation: DeathSpank gets guns). One other small change: DeathSpank will sail a pirate ship. Thongs of Virtue will sell for the same price as the original, $15 on PSN or XBLA. Millar acknowledged that Hothead is "seeing some demand" for a PC version, a natural given DeathSpank's PC adventure-game and Diablo roots, but he said Hothead is focused on the two consoles it is supporting for the series. A PC release and any third game in the series are hypothetical, to be released if the gaming market demands them.